About a year ago as we were in the appointment process, we attended Global Fair for the first time. It was so neat to talk to other missionaries and connect with their visions. This year we got our own table :) It was a bit intimidating. I wasn't sure what to use to explain our mission. What we did was "simulate" deafness by putting ear plugs in and using ear muffs. While we really can't get close to explaining the deaf experience, I think it opened people's awareness. We were able to talk about what communication with deaf looks like(even if you don't know ASL). 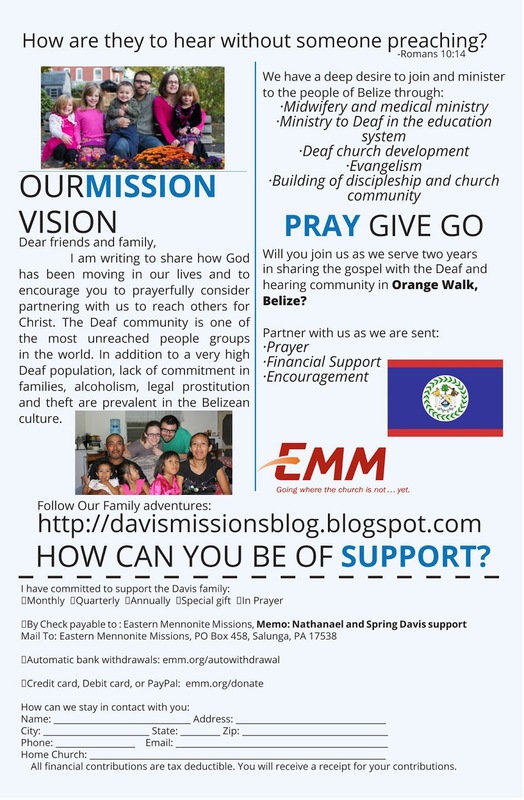 We also were able to highlight that deaf people are one of the most unreached people groups. Finally I printed out the British Sign Alphabet and the American Sign Alphabet, having them side by side. I used this to explain that sign language is NOT universal. Even though the British speak English like us, their signs are significantly different. We really had fun connecting with others and sharing our vision. We look forward to continuing to do that through different venues as we finish raising our support. , supporters. These people help us carry the vision God has given us. I am working on thank you notes, but for now I just wanted to make it clear how thankful and indebted to you we are. Wow! We just came off of sharing our vision at about 18 different places. It was a great time of growth, but tiring. The best thing though was being able to connect with people from so many different places. We have a few more opportunities lined up and hope to set up new opportunities for the coming weeks. God has blessed us by providing 34% of the needed funds to go to Belize. Our goal is to go in August in order to make it in time for me (Nathanael) to work in the school interpreting for the Deaf. This is extremely important, because there is no one else at present to fill this roll. If there is no one to fill this roll then the Deaf I am to interpret for receive no education. At the same time we really want to seek what God's will is for us as a family.